We all feel an affinity to the beautiful, unique and important coastal waters which make up the great Strait of Georgia. For so many of us in this region, outdoor recreation is a way of life and many coastal communities depend on the economic bounty that the Strait provides. We all share in the benefits of a healthy Strait but we also share a responsibility to help maintain a healthy and protected marine environment. At a time when we feel frustrated or helpless about the state of our world’s environment and the inaction of government leaders, we often ask “what can I possibly do to make a difference?” The answer, of course, is to “act locally” and start with a commitment to the very important body of water at our front door. 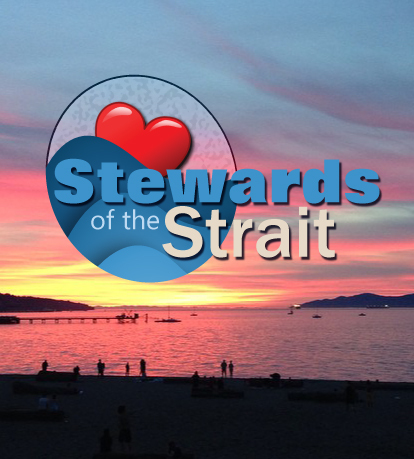 The Stewards of the Strait pledges provide you with simple but meaningful steps to make a positive impact on the health of our Strait. With your help, we can build a community of awareness and action. Let’s create a sustainable and vital Georgia Strait for today and for generations to come. Click on one (or more) of the pledges below. Canada has the longest coastline of any country in the world: 202,808 kilometers! It’s our responsibility to look after the parts of our coast that we use and love. 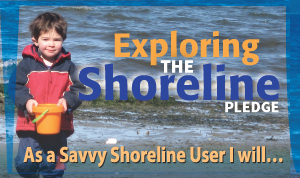 Follow Marked Paths To The Beach, rather than walking across sensitive shoreline areas. Be Careful Of Seashore Life and avoid trampling sea-life along the shoreline. Leave Everything The Way I Found It, including rocks, sand, shells and sticks. Handle Sea-life Gently with wet hands and leave it where I found it. Control My Pet and dispose of its waste properly. Respect private property and other recreational users. Report Environmental Problems to the proper authorities. Educate And Be A Role Model for other beach walkers. Get Involved in activities and issues that protect and restore marine life. Leave The Area As Clean Or Cleaner than I found it by disposing of my garbage properly and whenever possible cleaning up garbage that I find. Reconsider Having A Beach Fire. If I do, I’ll keep it small and below the high tide level. Help Organize Or Join A Beach Clean-up Day. Boating is a popular pastime! With over 350,000 boats in the Strait of Georgia, we need to minimize our impacts, especially in areas where boats congregate such as marinas, anchorages and marine parks. Manage My Sewage Responsibly by using pump-out services. Where no pumpouts are available, I will only dump as permitted by regulation, and I will dump responsibly away from anchorages, sensitive areas, shellfish beds and swimmers. make sure no fuel goes in the water. Use Bilge Filters Or Bilge Pads to absorb oil and fuel so none gets pumped overboard accidentally. Maintain My Boat, using environmentally responsible products and/or alternatives. Use “Hard” Bottom Paint Or Eco Friendly Alternatives. scrapings don’t end up in the water. 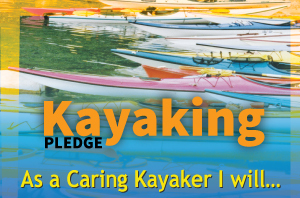 Help Other Boaters Become Aware by role-modeling and education. Follow Sound Practices And Principles as outlined in our Guide to Green Boating. responsible environmental policies and practices. BC’s outdoor tourism industry is growing quickly, and paddling has never been so popular! But even by having fun, we can put a lot of pressure on marine habitat and wildlife. Be Careful Of Seashore Life When Entering And Leaving The Water and avoid trampling sea-life along the shoreline. Maintain Distance From Wildlife and their resting places; keep 100m from marine mammals, including whales, as well as bird colonies and seal haul–outs. Avoid Directly Approaching Wildlife and paddle when it least disturbs them. I will retreat from an area by back paddling if wildlife appears disturbed. Avoid Touching Marine Animals, as there are a variety of ways I can unintentionally hurt them. Not Attempt To Rescue Wildlife that appears abandoned or injured. Use Shore Toilet Facilities Whenever Possible. Otherwise I will urinate below the high tide line and defecate in a 15-20cm deep hole at least 60m (about 70 adult steps) away from any water source and the shore whenever possible. Keep My Garbage Contained, including toilet paper and sanitary products, and take it home with me. Have A Valid Fishing License and keep up to date on closures. Respect Other Paddlers and all users of the water. Get Involved In Activities That Protect Marine Life and support Marine Conservation Groups. 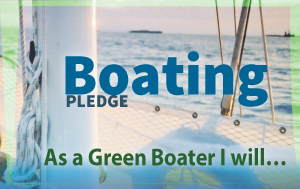 Follow Sound Practices And Principles as outlined in the Guide to Green Boating. Much of what is so special about the 10,400 square kilometer Georgia Strait is hidden below the water. As divers and water enthusiasts, we’re responsible for the future health of the underwater environment. Stay Informed About the Marine Life and Fragile Ecosystems In My Dive Areas and respect all creatures during my dive. Ensure All My Equipment Is Well Secured to prevent injury to marine life and habitat. 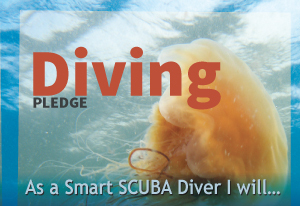 Keep My Diving Skills Sharp with continuing education and by practicing good buoyancy; finning and body control; and backwards swimming techniques to avoid unnecessary contact with the underwater world. Avoid Stirring Up Sand Or Silt so as to not cover up marine life. Dispose Of Garbage Properly at my dive sites and whenever possible collect recent garbage during my dives. Resist The Urge To Collect Souvenirs. Stay Informed About The Latest Fish And Game Regulations and obey all associated laws. Report Any Environmental Disturbances Or Destruction of my dive sites. Be A Role Model for other divers in diving and non-diving interaction with the environment. 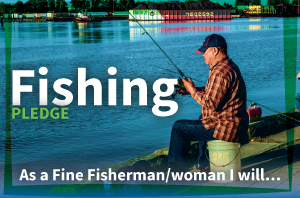 With more and more people fishing, fewer fish in the ocean and about 30 threatened or endangered fish species in our region, we need to make sure our fishing is sustainable. Fish With the Future in Mind, by keeping only what fish I need. Use Proper Catch and Release Methods for fish not kept. Follow All Fishing, Boating and Environmental Regulations. Dispose of All Garbage Properly including the notorious old fishing line, plastic bait bags and six-pack rings. Fish Only for Species that are Abundant and avoid species that are over-fished or poorly managed. Be Aware of and Respect Rockfish Conservation Areas. Avoid Spilling Pollutants like gas, oil and antifreeze into the water. Support the Creation of More Marine Protected Areas that will provide important refuges and breeding zones for fish. Avoid Fishing in Marine Parks. Help Educate other anglers to fish sustainably. Our region supports literally millions of birds, from three continents and more than 20 countries! Migrating birds rely on marshes, eelgrass beds, mudflats, beaches and flooded meadows in our region for their survival. It’s important that we keep these places healthy. Observe and Photograph Birds Without Knowingly Disturbing Them in any significant way. I will avoid chasing or repeatedly flushing birds. Only Sparingly Use Recordings and Similar Methods of Attracting Birds and not use these methods in heavily birded areas. Keep an Appropriate Distance From Nests and Nesting Colonies so as not to disturb the birds or expose them to danger. Stay on Existing Roads, Trails and Pathways whenever possible to avoid trampling or otherwise disturbing the fragile habitat. Leave All Habitats as They Were Found. Observe All Laws and the Rules and Regulations that govern public use of birding areas. Limit Groups to a size that does not threaten the environment. 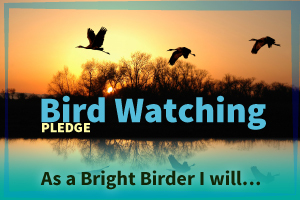 Teach Others birding ethics by my words and example. 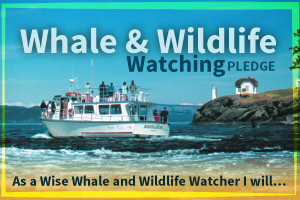 Nearly 7 million people live around the Salish Sea, and most of us love to see wildlife. But there are only around 80 Southern Resident Orcas left in our region, so we must make sure the activities we love aren’t harming these whales or other marine wildlife. Be Cautious and Courteous and approach areas of known or suspected marine mammal activity with extreme caution. I will look in all directions before planning my approach or departure. Slow Down and reduce speed to less then 7 knots when within 400 metres/yards the nearest whale/dolphin/sea lion. I will avoid abrupt course changes. Slow Down When Approaching Commercial Whale Watching Boats that are stopped or going slowly, even if I cannot see any wildlife. Stop Immediately and Allow the Whales to Pass if my vessel is unexpectedly within 100 metres/yards of a whale. Avoid Approaching Whales From Behind. I will always approach and depart whales from the side, moving in a direction parallel to the direction of the whales. Keep Clear of the Whales’ Path. I will avoid positioning my vessel within the 400-metre/yard area in the path of the whales. Stay on the Offshore Side of the Whales when they are traveling close to shore and remain at least 200 metres/yards offshore at all times. Limit My Viewing Time to a recommended maximum of 30 minutes so as to minimize the cumulative impact of many vessels and give consideration to other viewers. Be Quiet and Cautious when around haul-outs and bird colonies. Not Swim With, Touch or Feed whales or other marine mammals. Almost three quarters of BC’s population lives around the Strait of Georgia. 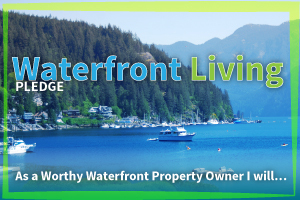 Those lucky enough to be waterfront property owners are on the front line for healthy interactions between land and water! Soften My Shoreline with native trees, shrubs, grasses and beach logs, so as to improve protection against erosion. Resist the Urge to “Tidy Up”, and instead, let organic debris like beach logs and fallen trees act as a natural sea wall. Landscape With Low Maintenance Native Plants, mow lawns high with a mulching mower, and compost kitchen and garden waste. Prune Trees Rather Than Removing Them, and plant native trees and shrubs to reduce erosion and runoff. Use Environmentally Friendly Products and Cleaners, or home-made non-toxic alternatives like baking soda and vinegar. Dispose of Used Oil and Other Pollutants Properly. Repair and Maintain my Septic System. Repair Solid Surfaces with porous materials and redirect gutter runoff into porous or vegetated areas, away from shore. Share Beach Access with my neighbours, and where possible, maintain a narrow winding trail so as to avoid accessing steep banks. Use Public Docks and Boat Launches, and/or consider replacing my dock with a low impact access option (e.g. a mooring buoy). Use a Well Maintained Lawn Mower and a 4-stroke outboard motor or fuel-injected 2-stroke.